Whether it is the orchestra, wind ensemble, percussion ensemble, jazz ensemble, opera/musical theatre orchestra, dance band, or world and ethnic music, Dr. Stephen Crawford brings his thirty-plus years of percussion performance to these varying ensembles. His love and enthusiasm for music, his interests in the advancement of the art, and the education of musicians of all ages has kept him in demand as a performer, conductor, clinician, and lecturer, throughout the United States, Canada, Mexico, and Ireland. He has a Doctor of Musical Arts Degree from the University of Missouri-Kansas City Conservatory of Music, a Master of Music Performance Degree from the University of Northern Iowa, and a Bachelor of Arts Degree in Music Education from Minot State University. Steve’s percussion performance career has allowed him the opportunity to accompany such musicians as Allen Vizzuti, Kevin Mohagany, Gary Foster, John Browning, Gordon MaCrae, Ashley Alexander, Steve Wright, The Kingston Trio, and The King Singers. He is the Principal Percussionist/ Timpanist with the Temple Symphony Orchestra. He has performed as a percussionist with the Minot Symphony Orchestra, the Waterloo/Cedar Falls Symphony Orchestra, the Lawrence Symphony Orchestra, and was the Associate Conductor with the Kansas City Civic Orchestra. 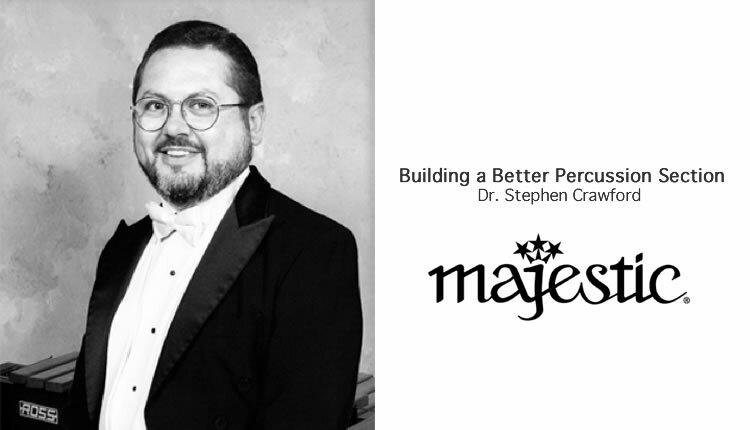 Currently, Dr. Crawford is the Director of Bands and Percussion Studies at Temple College. He conducts the Temple College Wind Symphony, Chamber Orchestra, and Percussion Ensemble. He is also the founder and musical director of the Ritmo y Mas Percussion Group, which is in residence at Temple College. He has conducted five world premiere performances of new wind music and has won the praise of composers such as Ken Langer, James Mobberely, David Wilkens, and Bruce Fraser for his interpretive conducting of their compositions. His continued interest in wind and percussion education has led to publications, which include The Care and Maintenance of Percussion Instruments in the North Dakota Music Educator’s Journal, and Building a Better Percussion Section. Dr. Crawford maintains membership in the Percussive Arts Society, the College Band Directors National Association, the National Association of College Wind and Percussion Instructors, The National Band Directors Association, the Texas Music Educators Association, the Texas Bandmasters Association, and the Conductor’s Guild. No band program can perform well without a well-rounded percussion section; yet most middle and high school percussionist are one-dimensional. The average high school percussionist is significantly deficient in keyboard percussion skills. Statistics show that more drum students quit music study than any other instrument family. Among beginning percussionist the pride of ownership (of an actual instrument) is absent, creating instrument envy. Percussion is the only instrument that is taught without giving the student a “real” instrument. The lack of keyboard percussion role models or icons in pop culture and television vs. drumset players perpetuates the one-dimensional percussionist. Band directors that recruit piano players to cover keyboard percussion parts further perpetuates the one-dimensional percussionist. Access to “real” instruments for home practice. Marimbas and xylophones are usually school-owned instruments. Affordability or considerations for renting marimbas or xylophones. – there is little consistency with how beginning percussionist are taught; snare drum kit? Percussion kit? drum and percussion kit? drum sticks and practice pad only? – students are naturally drawn to the more percussive “drum” than to the melodic keyboard percussion instruments. Encourage students to listen for keyboard percussion parts in television commercials, cartoons, and television shows. In the long run (weather it be from beginner to high school or beginner to professional) well-rounded percussionists are much better musicians and more marketable than one-dimensional percussionists. Establishing a well-rounded percussion section will contribute to breeding a well-rounded percussion section year after year. Provide instruments that are well-suited for the beginner. Height adjustable instruments are imperative to foster proper technique in the beginner. Students should have access to “real” instruments in order to avoid envy and discontentment. Start a percussion ensemble, which will expose all percussionists to keyboard instruments. Choose popular, familiar, and fun music to maintain the interest of percussion students. In their book, The Teaching of Instrumental Music, Richard J. Colwell and Thomas Goolsby state that there are two basis categories of motivation: intrinsic motivation (motivation dealing with long-range planning and goal setting) and extrinsic motivaiton (motivation dealing with day-to-day, immediate goals).1 Successful motivation of the student percussionist will ensure a healthy and happy percussion section and/or ensemble. Encourage the establishment of small ensembles. Develop a scholarship program for band and/or percussion camps. 1 Colwell, Richard J. and Thomas Goolsby. The Teaching of Instrumental Music, 42. Encourage manufacturers and retail stores to provide more affordable instruments suitable for beginning percussionists. Encourage composers and arrangers to produce more keyboard percussion ensemble literature, which is fun and exciting to play. Eyles, Randy. Mallet Percussion for Young Beginners, (Meredith Music Publications). Goldenberg, Morris. Modern School for Xylophone, Marimba and Vibraphone, (Hal Leonard). McMillan, Thomas. Percussion Keyboard Techniques, (Belwin-Mills). Payson, Al. Elementary Marimba and Xylophone Method, (Payson Percussion Products). Peters, Mitchell. Fundamental Method for Mallets, (Alfred Publishing Company). Pimentel, Linda L. Linda Lorren Pimentel’s Bar Percussion Handbook, vol. 1, (Permus Publications). Ervin, Karen. Contemporary Etudes for 3 and 4 Mallets, (Award Music Company). Green, George Hamilton. George Hamilton Green’s Instruction Course for Xylophone, (Meredith Music Publications). Stone, George L. Mallet Control for the Xylophone, Marimba, and Vibraphone, (George B. Stone & Son, Inc.). Meyer, Raymon. Multiple Mallet Studies for Marimba, (HaMaR Percussion Publications, Inc.). Moore, James, ed. It Only Takes Two: 18 Duets for Mallet Percussion, (Ludwig Music Publishing Company). Morleo, Luigi. 120 Progressive Four-Mallet Studies for Marimba, (HoneyRock Publications). Moyer, James. Four-Mallet Method for Marimba, (Studio 4/Alfred Publishing Company). Pimentel, Linda, L. and James L. Moore. The Solo Marimbist, Vol. 1, (Permus Publications). Whaley, Garwood. Musical Studies for the Intermediate Mallet Player, (Meredith Music Publications). Burton, Gary. Four Mallet Studies, (Ludwig Music Publishing Company). Gates, Everett. Odd Meter Duets, (Sam Fox Publishing Company). Gates, Everett. Odd Meter Etudes, (Sam Fox Publishing Company). Knaack, Donald. Music for Marimba from the Renaissance and Early Baroque Periods (4 mallets), (Paul Price Publications). Stevens, Leigh Howard. Method of Movement for Marimba, (Marimba Productions). Stout, Gordon. Etudes for Marimba, Book 1, (Paul Price Price Publications).